A Bamix isn’t just for Christmas. It’s for life ! It seems that everything Bamix says it can do, it does quietly, quickly, evenly, and expertly ! It’s no wonder that three of its products came at the tip top of our best hand blender recommendations for 2018, and again for 2019! The Bamix models come with different accessories or attachments. The accessories and attachments are made to the same high standard as the main Bamix blenders (see our in depth Bamix gastro 350 review here). The Gastro range and the Swissline were both equal winners in our best Pro grade hand blender 2018, and the Superbox ( essentially the SwissLine + accessories ) also got top spot for our best pro grade hand held food processor. Check out our post on how to compare and decipher the Bamix hand blender model names. We review all the accessories and attachments that they include, and the main buying criteria to help you choose the best one for you. Click over to see our thinking, and which one we bought as a result ! One of the reasons why we love Bamix is the sheer power that comes in such a small, neat, pretty lightweight package. Same goes for the accessories. True to its roots as the inventor or the hand blender, the Bamix accessories are also small and neat and stay mostly in the hands when blending ( except the blades of course !) The blades are sometimes reported to be hard to take off but in fact they just fit snugly so you just have to be firm with them – they are blunt edged and safe to handle. Have you seen the actual size of the tiny blades ! So tiny that Aoibheann whisks up her concoction or juice and spices in the glass every morning, followed by a quick rinse under the tap et voila ! Our detailed research online and face to face with Bamix shops helped us work out which Bamix to buy. It won’t be the same choice for everyone so we hope all that hard work helps you too! So we now that we have invested in a Bamix ourselves, and find that when you use the chopping bowl ( a.k.a. the processor or the wet / dry grinding mill) you automatically hold it in your other hand and work the chopper by moving it around. Have a look at the video below, or see Gordon Ramsay demonstrating also that on our celebrity hand blender page. 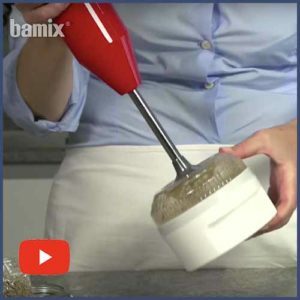 All the Bamix hand blenders are made of stainless steel and the motor is so well protected that you can even immerse the wand well past the end.. up to just under the buttons if you need to. There are several models and 3 stick ( or Bamix like to call it ‘shaft’ ) lengths. You can find more details on the main machine variations here. This is effectively the main component that clicks or sticks,, into the attachments. So we feel it’s important to point something out here. Unlike some other brands where the stick can be separated from the engine part in the handle, you cannot actually do this with the Bamix models. This means you cannot just change your shaft ( or wand or stick if you like) to a longer or shorter one. So, right at the beginning, you need to choose the model that has the length you want. In general, the shaft feels great to handle! It’s a nice shape to hold, has a balanced weight, and it’s quiet. Its fast and seems to work miracles with very few ingredients.Frothing up skimmed milk with strawberries is one of its most popular tricks! If you are in a hurry, use this summary to click straight through to see the blue linked products on Amazon. The main blade is the multi-purpose blade, then there are 3 others – the beater blade, the whisk blade, and the meat blade. The stands or wall bracket seem like just an accessory but as an owner of Bamix ( SwissLine) we find that we use the stand a lot ! It´s a precious piece of kit and it´s important to put the stick back on the stand firmly instead of standing it on its own or laying it down on the counter top. The next accessories are jugs and beakers, and a grinder (for dry ingredients) that comes with the deluxe model, or its updated version called the food processor (i.e. a wet & dry grinder) that comes with the SwissLine. The powder disk just takes things further and turns things… into powder! The SliceSy is what we would call a food processor and does all the grating and slicing. The Bamix hand blender is going to last you a good while, and its nice to be able to easily add accessories for future birthday gifts or stocking fillers! The latest Bamix models are essentially packages targeted at specific uses like BBQ, Baking, Smoothie making, baby food making and more. So the latest accessories are aprons, beakers, baby food jar etc. These are all detailed at the bottom of this page. You’ll be happy to know that the Bamix blades are made of food grade stainless steel but also feel quite blunt, so good for handling when the power is off of course! It’s really the Bamix engine that powers the blades that help it do such a good job. From reviews it looks like you do have to careful to line the shaft and the blade end up very well to get them to connect easily. Pulling the blades off can be difficult for some people, so just make sure the power is off when you’re concentrating on this bit! We actually started to get a bit bamboozled with all the blade names and what they meant. What was the difference between them, and what do they all do? More importantly what food can we make with each blade? After a bit of research here is our guide on how to decipher the terms. It includes all the techniques you can apply with each blade, and also the resulting food it will help you create. We also tell you what letter Bamix give it ( e.g. A blade) and what they look like by the way because some sales sites online mix the names up. That doesn’t help but if you know what it should look like and what it does then that’s 99% of what you need to know before choosing which one to buy. This is also known as the chopper blade or the C blade. The Multi Purpose Blade (Amazon) is great for pureeing soups and sauces, and ideal for baby food, chops and blends fruit and vegetables for juices, shakes and smoothies. Minces meat (although the meat blade does this specifically) or raw or cooked veg, and heavy batters. So you can easily make shortcrust pastry, brioche, and bread ! You can also make amazing ice cream and flavoured butters with its hard crushing action works wonders on ice or nuts. Basically, it tilts a little which allows it to get air into the mixture, hence the name aerator. Think of using it for anything that needs beating with a light touch. So you can now see why the Beater Blade (Amazon) is also called a foamer, or a creamer, a sauce maker. It’s fantastic for whipping egg whites or fresh cream and you will find it famous for turning skimmed milk into the consistency of cream (just add strawberries for a delicious drink!). How about meringues, sauces, soups, thick milk shakes and smoothies, whipped desserts, light sponge cakes, sabayons, milk foams, bernaise sauce, tiramisu, Chantilly cream, and hollandaise sauce. We could go on ! Also known as the blender blade or the B blade. It’s a stirrer, a mixer, whipper or emulsifier. Think of it as ideal for mixtures that need a thick consistency like light batters. Fabulous for emulsifying mayonnaise, making pancakes, crepes, waffles and omelettes. The Whisk Blade (Amazon) makes all sorts of drinks and cocktails, sauces & creams, dressings, and marinades. It even mashes your potatoes, makes cakes, purées cooked fruit and vegetables, and wow and behold, it makes face-masks! Also known as the mincer or slicing blade or the S blade. Basically it minces meats and creates pastes. It´s designed specifically to slice through, and mince and chop hard meat or fibrous vegetables, and even boned fish. The Meat Blade (Amazon) is a very versatile blade so you can still use it to chop and puree the veggies for your baby food or to get the lumps out of mashed potatoes or a roux sauce. Its good for fibrous ingredients so think of using this tool when you want to make a smoothie with difficult fruit and vegetables like rhubarb, leeks and asparagus. Do bear in mind though that it is not meant to be used to crush ice. The multi-purpose blade does that. The Grinder (aka the Grinding Mill on Amazon) is designed to grind dry herbs, spices and many other dry ingredients. We’re really not sure which came first.. the dry or the wet dry grinder, but it seems that the both wet and dry one is the supported one now to act as the catchall mini processor attached for Bamix hand blenders, and the powder disc only works with this one to provide the ultimate pulversing tool! If you do end up with a dry grinder only, its not the end of the world as, although it is meant for dry ingredients only, most people say you can also use it to chop herbs (leaves that you have removed surface water from for example) or veggies (again, dry surface). I also found an unusual use for the ‘dry’ grinder when a user reported it works well as a stand! Surprisingly stable it seems. The blade in the “dry” grinder is like a short steak knife and is great for grinding spices to powder. The Bamix Wet and Dry Mill is a grinder mincer “processor” add on. Not very big at all and very like a coffee or spice grinder or miniprocessor size. All components are dishwasher safe and BPA-free. This item is compatible with all Bamix models. Also known as the Wet and Dry grinding mill or the Processor on Amazon. 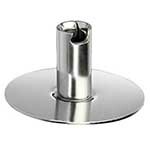 It has 5 elements: the lid, the base, the bowl, the stainless steel shaft and the blade. It is designed to grind both wet and dry ingredients. So, like the dry grinder, it is brilliant at grinding dry spices like vanilla, cinnamon, nutmeg, cardamom etc. It equally grinds nuts, grains, chocolate, coffee beans, and even ice. However it also grinds herbs, onions and tomatoes and much more. Actually its been developed for grinding, milling, blending and mincing! It’s fantastic for making your own condiments like salsa, mustard, guacamole, harissa, tapenade, hummus, relish and curry pastes. It can also make your pates, nut butters, or just simple take the tears out of onion chopping! It can be used to grind ice, hard or soft cheese, or for making crumbs out of dried bread, fish or mushroom, or for grinding herbs and citrus peels. Its fantastic for small portions of home-made baby food, spreads, or to make fast salad dressings. It’s fast at mincing garlic, coconut, chilli, horse-radish, all kinds of herbs and small quantities of meat or fish. You will need the extra pulveriser powder disk piece below to do the sugar and salt to a very fine consistency. What we love is that it fits neatly on the back of the stand – being just 12 x 12 x 9 cm. So a nice small size to hold in your one hand, whilst you have the blender in the other hand. Try not to fill it more than 2/3rds full. There’s also a reason you see people demonstrating it in mid air… it works best if you move and shake it about a bit whilst grinding. That way you get nice even grinding. Officially, its capacity is confirmed as 200ml, but really people have said that it can be 250ml max. I suppose it depends what foodstuff you’re talking about. A helpful foodie mentioned it takes a large slice of bread torn into bits to make breadcrumbs, a large handful of herbs, about 4 or 5 oz sugar ground down to caster sugar, or a handful of nuts to be chopped. It’s easy to wash with warm soapy water, and all components are dishwasher safe and BPA free. We have so much to write on the processor. Can you tell we’re sold on it? We used to have a separate mini grinder / chopper in the past, so we know how useful it is. We found that it does need enough moisture to form a paste and often this is more moisture ( water will do) than the recipe calls for. It’s also easy to reduce garlic & ginger to a paste simply by adding a little water. (No need for you to buy those tubes of garlic paste then !). Here’s a handy recipe we hung onto for some time ! 4 cloves of garlic with a 3 tablespoons water.. add the water a little at a time to get the paste you are looking for. By the way, apparently any excess water goes away when you start cooking with the paste in hot oil. Neat! It’s also great for spice and nut grinding.. making flour from seeds. Try sunflower seed powder / flour . We use that in place of breadcrumbs or just to thicken things ! For the freshest coffee grind your own fresh coffee beans. For sugar, start raw and do a fast refine yourself to castor sugar, and then further to icing sugar…in seconds. This attachment is compatible with all Bamix models and we think this handy little attachment to the Bamix will save you time, money and effort! Watch the wet and dry chopper in action video here. ( Note: the powder disk is included with the wet/dry processor in the U.S. link below). 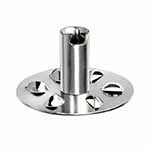 The Powder Disc is an accessory to the Wet & Dry Grinding Mill and is not compatible with any other Bamix product. The Powder Disk ( see it here on Amazon and be amazed ! It’s the best little extra we have ever bought !) It sits on top of the blade inside the Wet & Dry Grinding Mill and is designed to grind herbs and spices (e.g. pepper, coffee, sugar, cinnamon, etc.) to an extra fine powdery consistency. 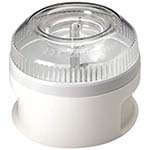 The Powder Disc is made of a transparent polycarbonate plastic, which is durable, shatterproof and dishwasher safe. Add the SliceSy and you get the food processing unit that we would use most for little jobs like slicing and grating. It’s such a time saver and much safer to use than a mandolin. Personally, I (Aoibheann) do love chopping with a knife when I have time – I find it so therapeutic. Many reviewers talk about having arthritic hands though, so the Bamix is a godsend for that. It’s also so perfectly engineered that it produces nice even slices, even for onions. I certainly can’t do that with a knife! The Bamix SliceSy (click through to see lots of variations on Amazon) usually has a large main S blade for larger amounts of chopping ( or kneading !) . The full or complete Bamix SlicSy set as its known, has 5 extra accessories…. A thick and a thin slicer, and both a coarse, medium, and a fine shredder / grater. So you can process vegetables, fruits and cheese to make simple easy salads. It can even slice olives, nut and grapes to top them off nicely. You can make a nice tartar or burgers from lean meat or fish, and short pastry or cake dough. Washing the top part of the slicesy seems to be a sore point though as this is one accessory that cannot be completely submerged in water. The rest can go in the dishwasher! The attachments are also sharper than the wand blades so be careful. The basic Bamix SliceSy set comes with just two blades – the coarse slice and coarse grater, so this a good set to add to it. This trio turns the Bamix basic SliceSy food processor into the complete set. 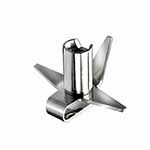 Three extra blades in durable stainless steel for the Bamix SliceSy. So don’t worry if you didn’t start with the complete set. You can get the extra SliceySy blade set here from Amazon to add to it. This includes the fine and medium graters, and the thin slicer. Ideal for helping chop, grate and slice fruit, vegetables and more. Dishwasher safe too. What we mean by accessories is… what Bamix make to work with the bamix blenders, as opposed to the pieces above that have to attach to the blender shaft itself. Bamix are starting to add even more new accessories to make up some neat packages for young families ( bamix babyline ) , foodies ( bamix jamie oliver ) etc. So moosey on down to the bottom of the page to check these out and also see some nice accessories we have searched out for you too, so that you can configure your very own customised Bamix blender and accessory package too ! You can even now get a cap with Bamix or #gastro on it ! Depending on the model you buy, it can come with either nothing, or a wall bracket, or the countertop stand. The wall bracket is a simple soul, it fits all models but it is usually delivered without screws! You can buy them separately. The three Bamix stands, shown above, are also really a storage units for at least the blender blades, and sometimes the processor too ( at the back of the Swissline stand). They also look so cool on the counter-top, and hold the wand nicely at the front so you can grab it easily and put back when you’re finished. There are three stand types. One that comes with the deluxe models, one with the swissline or superbox sets, and one that comes with the classic selection set. You can’t usually buy them separately though. We used to see the Swissline stand for sale but not any longer, so if the stand is important to you , then choose the model with that stand when you first buy your blender. A 400ml small size and the 600ml medium size come with markings on the side, a pourer, and a snap on lid for better food storing. The measurements by the way don’t show the final limit. For example the 600ml beaker shows 500ml as its top measurement but if you fill it to the top it is probably 600ml when full. The 400ml is a nice smokey-colour. They can come with, or without lids, and the lids can be in a neutral stone colour, or black. You can also get handy sets of both 400 and 600ml bamix beaker together. The bamix beaker is made of Polycarbonate which is break and shock resistant . It’s suitable for use in fridges, freezers and microwave ovens, and is also dishwasher proof. The 600 ml beaker shown here on Amazon is the most popular at 15.4 x 10 x 10 cm it is about a two person portion. It seems though that all sizes are very useful and a lot of people have talked about getting the lot! When you buy a Bamix blender it usually comes as a 1 litre jug, and depending on the country, it can be supplied with or without a lid ! Users say that the jug with the lid is really 900ml not 1000ml. So at least when you are buying the jug separately you can see, and choose, what you are getting. The 900ml / 1L jugs have a handle and measurement markings in both ml and oz. It is BPA-free, freezer, microwave and dishwasher safe. Heat resistant up to 100℃. It also is nice and clear, and the inside design is nicely shaped to work with the Bamix blender. It also has a nice lip for pouring. We have to say, we have plenty of jugs, including the Braun blender jug, but we reach for the Bamix every time ! But we thought… what if we already have these accessories ( e.g. a nice apron for BBQ-ing) then it would be a waste paying for them in a packaged up set. Or, better still , what if we could choose our own packages ! So why not choose your favourite machine, we give you the low-down on all the machines here, and then add some Bamix or other alternative high quality accessories to use with it. Also, what if you already have a Bamix for years and years already ! Why not give it some attention, and add some other accessories so that you have even more fun when using it. We’ve had some fun searching out accessories worthy of working with the Bamix blenders. With these you can achieve the same, or maybe even better Bamix packages yourself. Hope you enjoy them too. Aoibheann has a 200 watt Color Line model, and it’s the same colour as the Jamie Oliver edition – Anthracite grey. She prefers it because, much as though she is a big fan of Jamie, she didn’t feel the need to have his signature all over it. The beautiful classic Bamix signature is enough. When Jamie Oliver made his programme “Jamie does Marrakech” at our boutique hotel maison mk, we didn’t splash our name all over his work either 😉 Well truth be known our guests recognised the unique rooftop with its distinctive orange voiles anyway. blender blades (multi-purpose, whisk, beater), 1000ml bamix beaker, deluxe model stand and baby food recipe booklet. You don’t get any extra blender accessories with this package – just the signature, the cool colour and a recipe booklet by Jamie Oliver about the brand. So, just as the orange was our signature in Marrakech, if you can’t get or don’t want the Jamie model itself, go for the Anthracite grey colour line model and it will be instantly recognisable ! and treat yourself to a Jamie cookbook while you’re at it. We have many but our latest favourite is Jamie’s 15-minute meals. The Babyline model is a 200Watt machine with a 400ml glass food container. So you could just choose a Deluxe, Swissline, gastro or colorline model for the main machine. blender blades (multi-purpose, whisk, beater), 400ml bamix beaker with lid, 400ml glass baby food container with lid, deluxe model stand and baby food recipe booklet. For baby food storage with leakproof lids – we think you might need more than one ! We love these – the colour coded BPA free 4oz (the dry erase marker makes it a winner !) jars from WeeSprout, or silicone 10 pot food trays, also from Kiddo Feedo or Insenso (Spain only). All on Amazon, and we’ll guide you when you click through, to the links to each product that is available on Amazon in your country. Be aware though, in the U.S. and Canada you are spoiled by having both the jars and the silicone trays available, so have a ball, and get them all ! Going more generally, and as our own baby is all grown up now, we would personally go for these these high quality ( but reasonably priced ) eco friendly Borosilicate glass containers with sealing and snap on lids (found on Amazon) . Stackable, and with a removable rubber gasket to ensure it’s airtight. You can freeze, reheat, serve from, and clean in the dishwasher. The colorline is essentially the swissline, so comes with the same package as the Swissline. Blender blades (multi-purpose, whisk, beater), 1000ml bamix beaker with lid, swissline model stand, and recipe booklet. Given that this model has the most colours, we would add some cool colourful accessories to our alternative package. Have a look at the Mira range suggested in the toGo section below, or we would go for the Amazon KAMOTO 4oz mason jars with coloured checkered lids. Ideal for storing those DIY spice blends, jams, sauces, and baby foods you’ve made with your Bamix. Well, actually, this section is doing that for you! We think this is a great idea, and that was the point anyway of this whole article… so that we could help you configure your own perfect Bamix blender set. A bit of bling luxury in terms of the blender body colours offered here. From white and black, to black beauty, carbon, copper, chrome, starlet and princess, gold crown, and the ultimate 24 carat gold queen model. blender blades (multi-purpose, whisk, beater, meat mincer), wet/dry mill processor, powder disc, 400 ml and 600 ml bamix beakers, 1000 ml jug and stand. additional luxuryline blender accessories… more is more when it comes to bling ! Of course, going a little over the top, in style, we would add these from Amazon… the Alessi 24 carat gold plated bowl to hold your grapes, or a Fitz and Floyd cake stand so you can have your cake and eat it. This is a simple set aimed at the fit and busy bamix customer ! The idea is to make a smoothie, juice, soup etc in the beaker and run with it! It comes with blender blades (multi-purpose, whisk, beater, mincer), a 500ml thermo beaker and a recipe booklet. You could go for the silver coloured thermos branded stainless steel jars, but we personally love the mira stainless steel powder-coated colour range. They’re so versatile, and you can probably choose a favourite colour , or even one to tone in with your own Bamix ! They say the ideal gift for men and BBQ lovers – it comes in Black ! blender blades ( multi-purpose, whisk, beater, meat mincer), processor, power disc, 400ml and 600ml beakers, stand, bbq recipe booklet and apron. Well this is the Superbox set really, in black or cream colours. So just buy the baking or superbox if you see it. Nothing to add or replace here as its pretty perfect don’t you think… ok then, you’ve twisted my arm. How about this gorgeous vintage looking cream cake tray with glass dome shown here on Amazon, to show off the final results! Stay connected... reap the benefits. We’d like to know you better too. Join our community and let us know what we can do to help you! 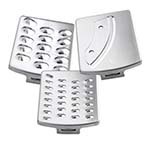 Have just been reading all this as been looking into making pastry using the C blade, as I have arthritis & now finding it harder using my hands. Am teenager at heart but machinery 70 this year!😀 Anyway, wanted to try this before buying sliceasy att. Bought Bamix at London Ideal Home Ex 9 yrs ago. At the time was hesitant as so costly-but, its worth its weight in gold. I use it so many times a week, could not do without it! I do all cooking & baking for myself & wife-totally in my element in the kitchen. Will try the C for pastry. Thank you. Hello John, how lovely to hear from you. Good luck with the pastry. About the C blade – the multi purpose blade. This is the one that usually comes with the Bamix machine ( even if you only get one blade). Do you have this already? We use this blade most of the time ( although the whisk blade has been a new joyful discovery for mixing ground ginger and tumeric into orange juice perfectly!). Let us know how you get on. If young at heart means a facebook user, please do like the facebook page and join the private group where we can discuss lots and share interesting things.) or sign up to be an email subscriber for a direct link to Paul and me, and get the freebies. On the subject of the SliceSy… you would need that for more kneading jobs I feel. Also, do you travel a lot – or have a holiday home you travel to ? I ask because I’ve just been travelling with hand luggage only, and missed being able to take my Bamix with hand luggage only. I am very tempted by the Masha 2x list in mashing and batter making, and great for arthritic hands by all accounts. It’s just a alternative for you to look at as it’s less than half the price of the sliceSy at the moment. How can I change the blade in my grinding mill? Hi Nicky, thanks for writing. We bought the Swissline with the processor ourselves (the wet and dry mill), not the dry only grinder so can’t examine it right now. We are not a dealer or anything and we don’t sell them but we are huge Bamix enthusiasts and want to know everything about them too. So we will try to get the answer for you from all the contacts we have. Hi Nicky – we have been talking to the Bamix distributor here in Holland and the grinding mill we are talking about (which is made of completely clear plastic, NOT with a black or white base) has a blade and a vertical stalk that are both moulded together. This blade / stalk just lifts out of the mill easily. There is nobody on Amazon stocking the replacement part at great prices, but you can still get them from Bamix UK directly at the standard MRP (Manufacturers Recommended Price). Thankfully the part is only 12.50 euros over here so should be about 10-15 pounds in the UK. I have to replace the 4 attachments for my Bamix immersion blender and the 5 attachments ( graters and slicing) attachments. Do you sell replacements only for these 2 Bamix products? Hi Sally, we have done an in depth review of our two Bamix machines but the blades will be the same for all. That’s the beauty and simplicity of Bamix 🙂 If you click through any of the Buy Now on Amazon links you will be shown similar products and should find everything you need there. Good luck, and thanks for asking.